Arlanda Airport is Sweden’s largest international airport by a good margin. Although it sits closest to the town of Märsta, Arlanda is only 23 miles north of the Swedish capital city Stockholm. Even by European standards, Sweden is a fairly expensive country to travel in, with even the most budget conscious of travelers facing prices around $75 per day. Summer is notable as the peak tourist season in Sweden; during this time of year, temperatures typically fall between 16 and 21˚C (60-70˚F). Winters in Sweden are cold, with temperatures plummeting to below -10˚C (14˚F). Although the traditional souvenir for Sweden is undoubtedly the Dala horse, modern souvenirs like fashion accessories and boots are also hot items. Though the Scandinavian country of Sweden is Europe’s third largest in terms of land size, much of the country is remote and uninhabited, giving it one of the continent’s lowest population densities. That said, the country’s sparseness and huge swaths of relatively untouched wilderness are one of its biggest draws for tourists, who come for the hiking, skiing, and general freedom that comes with the great outdoors. Of course, not all of Sweden is vacant land; the country also features a number of cutting edge cities. 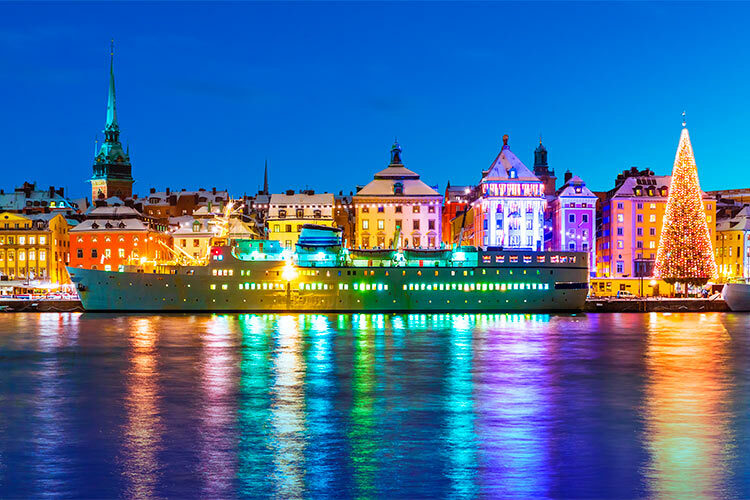 The most notable, of course, is its capital city Stockholm, which many travelers consider to be one of the most charming cities in all of Europe. No matter what destination you’re traveling to, knowing a bit about the area’s history can improve your trip immeasurably. Sweden is no exception to this rule. Like most of Europe, Sweden’s early history was largely dominated by unorganized bands of hunter-gatherers. The first notable civilization to arise in Sweden was the Vikings, who ruled Sweden from the 8th century through the 11th century. Though modern pop culture paints a somewhat inaccurate picture of the Viking people, it is true that these brave Swedes explored all around the world long before Western Europe. They also left behind a number of rune stones, which today are both important learning tools and tourist attractions. No scholar can realistically say when exactly the kingdom of Sweden truly began, but it’s widely believed to have happened slowly during the time of the Vikings. By 1100 CE, Sweden had made a distinct shift from its Viking roots, adopting Christianity and a more unified governing body. During the Middle Ages, Swedish citizens enjoyed remarkably more freedom than the rest of Europe. The country never really took to slavery, nor did it implement a casted feudal system. Towards the end of the Middle Ages, Sweden unified with Denmark and Norway. At first, this helped the Swedish economy, which lagged behind other European countries. However, control of the three countries soon fell solely to Denmark. In 1523, after a few years of conflict and blood, the Swedes asserted their independence. Just one hundred years later, Sweden enjoyed a reputation as one of Europe’s most powerful countries. It expanded its land size considerably, and was largely successful in its military efforts against neighbours like the Holy Roman Empire and Russia. Unfortunately, Sweden was unable to hold its non-Scandinavian territories for long, and soon it receded to the borders it currently enjoys. The country was slow to industrialize, but was able to remain neutral during both WWI and WWII. Because of this, it didn’t experience nearly as much devastation as the rest of Europe during the 20th century. There’s little doubt that this helped modern Sweden to achieve the high quality of life and democratic freedom. In recent years, the largest problem Sweden has faced is dealing with the huge numbers of migrants who wish to immigrate to the country. No traveler should visit Sweden without stopping in the unique city of Stockholm. The inner city spans 14 islands, which are connected by a series of waterways. In fact, it’s estimated that roughly 30% of Stockholm’s land area is occupied by waterways. Another 30% of the city is protected parks and greenways, so it’s not surprising that most tourist guides recommend activities like hiking, cross country skiing and mountain biking. Many of these activities can be found in the gorgeous Stockholm archipelago, a series of some 24,000 islands beginning 50 miles east of the city centre. Being an old European city, Stockholm also features its fair share of historical attractions. The most notable of these are scattered about Gamla Stan, the city’s old town. 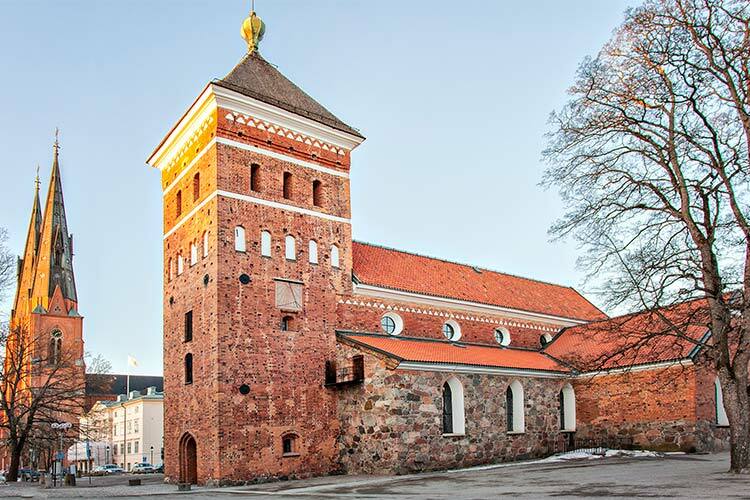 Here, travelers can find the Royal Palace and the stunning Riddarholmen Church. The city of Gothenburg is widely considered one of the most friendly places in all of Europe, due largely to its enormous student population. Travelers to the city are highly encouraged to spend time simply wandering the streets, stopping in the numerous cafes and boutique shops, and generally getting a feel for the pace of life in this unique city. The district of Haga is a particularly lovely area for a walk, as it features numerous 19th century buildings constructed from wood using traditional methods. 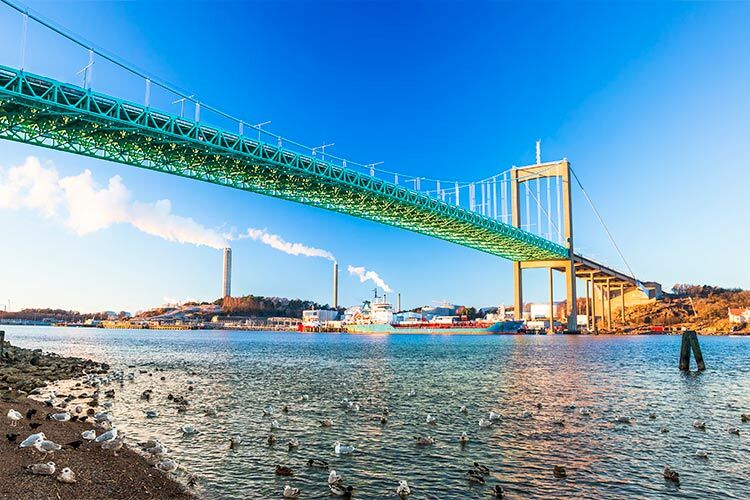 Gothenburg has a handful of attractions that top most traveler’s to-do lists, namely the picturesque military fortress Skansen Kronan and the famous Gothenburg Art Museum. The city also features a park, Slottsskogen, that is well known for its large collection of azaleas from across the world. For most travelers, there’s only reason to travel to the small village of Jukkasjärvi: the ice hotel. This town features the world’s largest ice hotel, which is built every year and features a number of shockingly ornate decorations and motifs. Though it can be quite expensive to stay in the ice hotel, it’s a once in a lifetime opportunity that’s well worth the money. Besides the hotel, Jukkasjärvi is also a great destination for wildlife enthusiasts. Many tours in the area offer travelers the ability to see reindeer, as well as the traditional Sami, or Laplander, peoples. 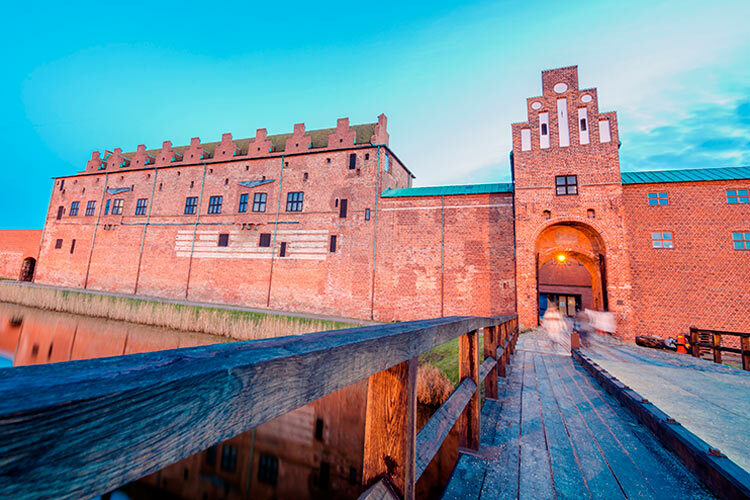 1) Malmö’s city centre features a number of interesting historical sites, including the Malmöhus Castle. The city is also famous for the Turning Torso, which is the largest building in all of Scandinavia. The area surrounding the Turning Torso features some of Sweden’s best shopping and dining options. Malmö also features a beach, Ribersborgsstranden, which is perfect for soaking up the rays during the summer. 2) Wander the streets of Haga, one of the most attractive districts in Gothenburg, and admire the traditional architectural style. Then, head over to the impressive Skansen Kronan to see an old military fortress. Finally, spend time relaxing in Slottsskogen Park, one of the city’s most beloved and attractive green spaces. 3) In Stockholm, be sure to visit the Gamla Stan, the city’s old district. Here, you’ll find traditional Swedish government buildings such as the stunning Stockholm Royal Palace. Riddarholmen Church should also not be missed. If you’re up for a day trip, don’t miss the Stockholm Archipelago, one of the world’s most attractive island chains. 4) Åre is considered not only one of the best ski resorts in all of Sweden, but frankly in the entire world. The resort features four distinct areas, each with a number of slopes of various difficulty levels. Åre is also famous for the Tännforsen waterfall, which completely freezes over each winter. 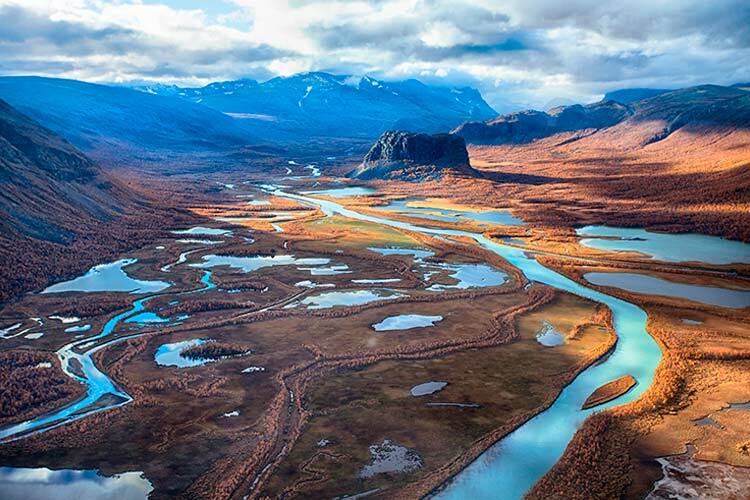 5) Remote Sarek National Park is an adventurer’s dreams. Known for its 100 glaciers, Sarek features no lodges or other types of accommodation. In fact, the park doesn’t even feature any maintained trails. If you’ve got the skills and desire, this park is one of the best destinations to see untouched northern wilderness. Sarek National Park also has the distinction of being one of Europe’s oldest national parks. 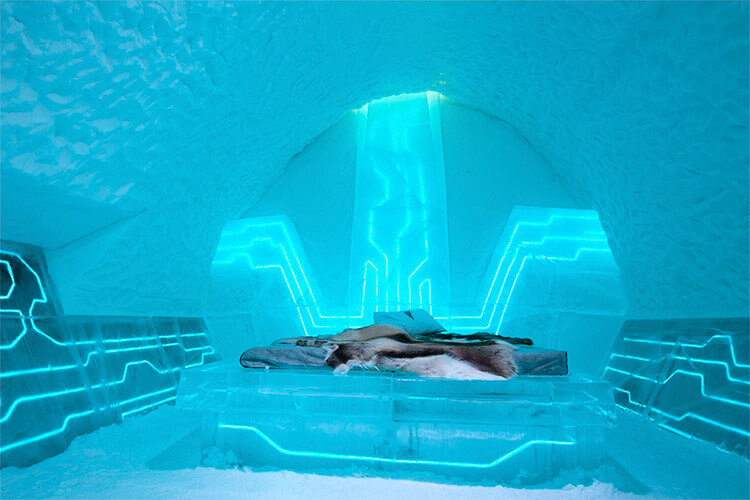 6) If you’ve got the money, there’s nothing quite like staying in the famous ice hotel in Jukkasjärvi. Besides being the world’s first and largest ice hotel, the small village of Jukkasjärvi and surrounding wilderness make for the perfect setting for a relaxing northern getaway. 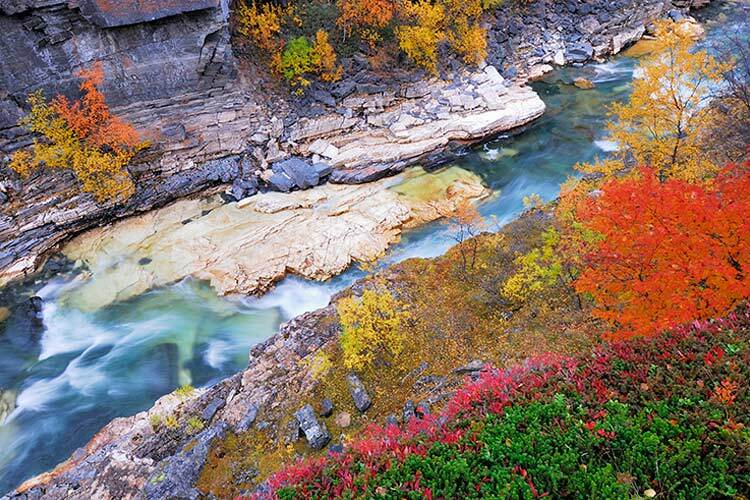 7) Abisko National Park is located deep within the Arctic circle, making it one of the most remote destinations in Sweden. However, the park is renowned for its shockingly beautiful landscape and endemic wildlife. Travelers often reach the park via the Kungsleden hiking trail, which follows along many of Sweden’s northern mountain ranges. The park is also at a high enough latitude to enjoy phenomena like the northern lights and the midnight sun.